You can create custom contact fields, which will appear for every contact in your database, to suit your organizational needs. Aside from the already existing contact fields, your organization may need to store additional information for each contact. Some organizations may need to store their contacts’ credit card or account details, for example, while others may wish to add a ‘revenue’ field for their contacts. 1. Click on My Account at the top right of Kazeli. 2. Under the Account Settings section, click Custom Contact Fields. 3. 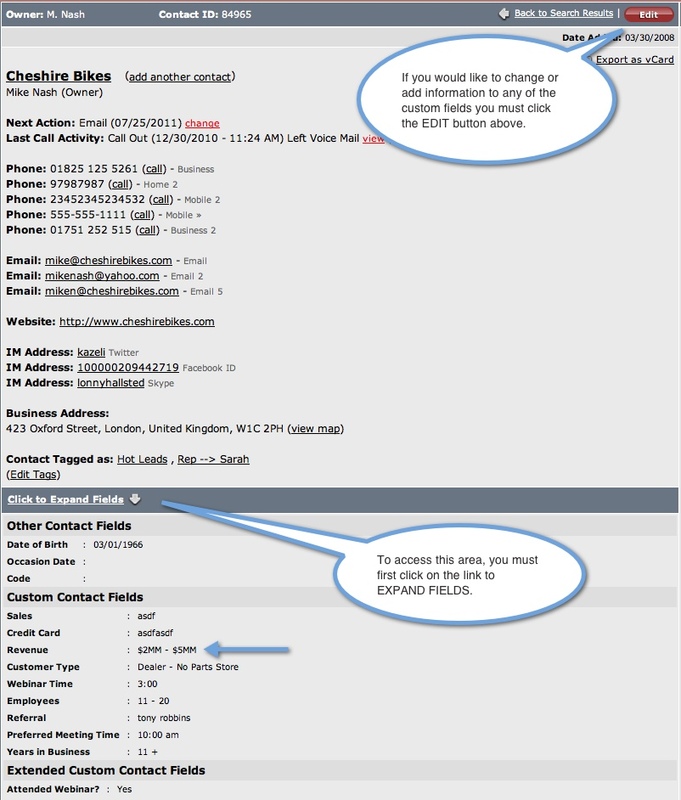 You can enter up to 20 custom contact fields in the spaces provided. By default, your contact field will be created as a text field, meaning you will type in values for the field for each contact record. However you also have the option of creating a dropdown list option for your custom fields. a. Click on [+] edit beside the contact field. b. In the new window, click new. c. Type in one of your dropdown list options and click submit. d. Your option will now appear as part of the dropdown list in the contact field. To edit or delete a dropdown list answer, check the box beside the answer and click edit or delete. 4. Click Submit. You have now added your custom contact fields and they will be viewable from the Fields tab on each contact record. 1. From the side navigation click on Contacts. 2. Using the search options at the top, search for a contact. 3. Click on a contact name in the search results. 4. Click the Click to Expand Fields link in the middle of the contact window.